A few words about Opera Mail. This e-mail client gained popularity alongside with the web browser. Being an integral part of the browser from the very beginning, the mail client offered a decent performance coupled with a lot of messaging functions many classical mail clients of the era missed. Today, Opera Mail is still available for download, but is discontinued. Which is bad, because hundreds of thousands of people still use it and have probably gigabytes of mails encased into the Opera’s native format *.mbs. But the king is dead, so long live the king. It is time now to migrate to other solutions, and many people today prefer to use Microsoft Outlook instead. But how to export from Opera Mail to Outlook? The MBS format (formerly M2) it used to store mailbox data in is not supported by Outlook regardless of the version be that 2003, 2010, 2016 or 2019. Well, here is how. 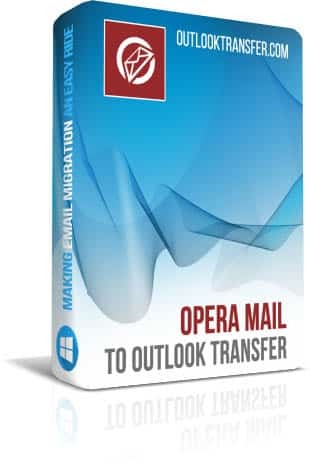 Opera Mail to Outlook Transfer – Automatically transfer email messages from Opera Mail directly to Outlook or to a PST file with this simple and fast application. Why use a third-party tool in the first hand? Well, for one thing, as we said above, MBS is not supported by Outlook. This means you have to make exporting from Opera Mail manually and hope that what you’ve got in the end will import flawlessly into Outlook. Based on the amount of Google queries on “how to migrate from Opera Mail to Outlook”, the manual transferring is not as easy as it may seem. Another issue is possible encoding mismatches, a frequent problem while conversion of mailboxes containing non-English e-mails. So, if you really care for safety and integrity of your information, you should migrate using Outlook Transfer software. The thing works simply, here is how. This may sound contradictory – automatic and error-free – but this is what we were up to. The tool is equipped with special analytic algorithms and multi-threaded processing that helps making the conversion process both fast and accurate while remaining 99% automated. The only thing you do manually is select a folder where MBS files are stored. A problem with much utility software around is: it is way too technical sometimes. Opera Mail to Outlook Transfer is different in that. We designed the program so that you can use it easily even if you have never did anything like email migration before. Specifically, we designed a sleek user interface that requires minimum configuration, because all the required settings are either determined automatically or are set by default. Literally, you run the program – you enjoy the result. That’s it. You can move your Opera emails to Outlook, or create a new PST file and export the messages and folders there. In addition, you can import mails from Opera to any existing Outlook folder, or automatically split the resulting PST file into chunks of a predefined size for easier transferring. When you use a mail client long enough, the mailboxes tend to get messy. 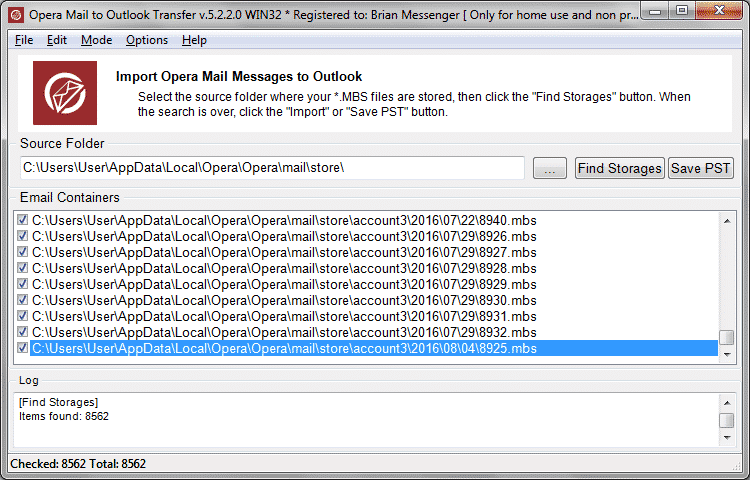 Various encodings (often within the same thread), gigabytes of attachments, embedded images and a branchy folder structure are no problem for Opera Mail to Outlook Transfer. While in other migration solutions you have to manually control all these things, this tool ensures maximum accuracy while transferring your data to PST. Sometimes mailboxes can even be damaged and do not read or open normally. This makes the already tough migration even harder. But with Opera Mail to Outlook Transfer you should not worry about that – the software can handle a majority of broken or damaged MBS files automatically. With such a great “horsepower” under the hood Opera Mail Transfer can make the upcoming migration of data from Opera to PST incomparably easier. Think of it: a typical migration procedure if done manually looks roughly like this: take a folder you need, export it from Opera, then take the resulting file and import it to Outlook. Rinse and repeat for EVERY folder you have. That’s not what we call time-efficient to say the least. Also, Opera Mail offers the so called “views” – arbitrary sections of the entire mail database. So you can make manual exporting a bit easier if you create a custom view that holds all of messages you have and then export it. But still, in this case you end up with hundreds of thousands (if not millions!) of messages all saved into the same file without any structure. Dealing with that “all-in-one” file is hardly easier. 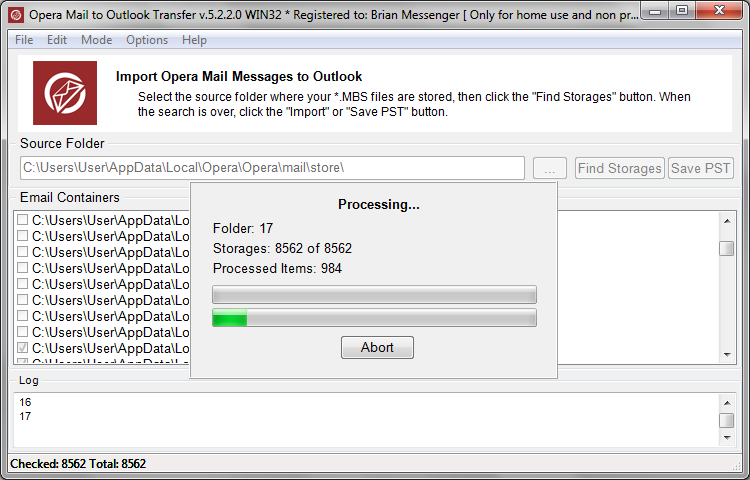 With Opera Mail to Outlook Transfer things get much better. Instead of doing manual exporting, you instantly order the program to perform the migration for you. This saves you a whole lot of hours you can now spend on your real work. Or just lean back in your chair while the program does all the job. “Manual” means you do this. And we are all prone to errors, so sometimes you may and up with a non-working or incorrect mailbox data. With accurate automatic conversion the result is always perfect. Don’t worry about such technical details as encodings, attachments, various version-dependent tiny changes in mailbox format and so on. The program takes all of these into account and performs flawless exporting. 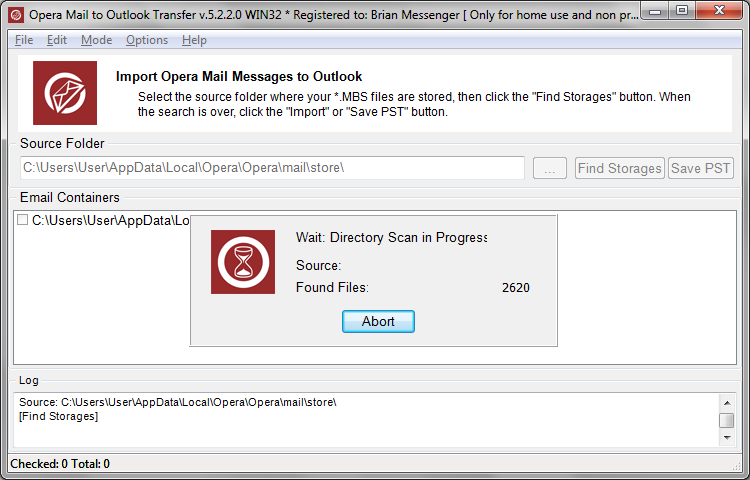 Opera Mail to Outlook Transfer supports conversion of huge oversized mailboxes (> 4 GB) and can read and convert Opera to PST regardless of the version. Surely, this is often pivotal option, because of the large size of older mailboxes with tons of messages in them. Save this feature you would have to split the mailbox somehow and export it chunk by chunk. With this program, however, you process the whole database in just one round. After the conversion you get the same folder structure you had in Opera Mail. No need to adjust or rearrange anything. Just continue your work in Outlook now. That’s pretty neat. Compare that with manual migration and feel the difference. 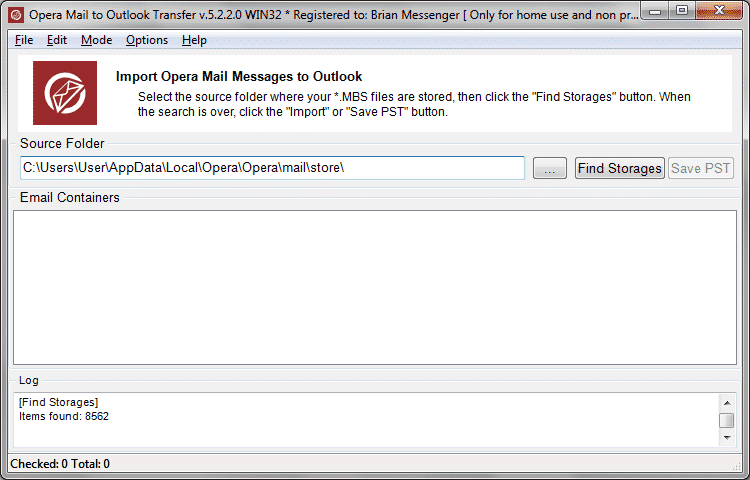 If you are serious about moving from Opera Mail to Outlook, you should really consider Opera Mail to Outlook Transfer. This software has everything you need to effortlessly convert Opera emails to the PST format and hence be able to continue your work without pause after switching mail clients. Moreover, you can be sure every single byte of your e-mail correspondence is secure and is accurately transferred to Outlook. Download the software and finish moving Opera mailboxes to Outlook today!